The McCarren Park pool, which has only been up and running as a functional pool since 2012, is back in business for the summer 2016 season. The pool was originally opened in 1936 by Robert Moses, who was curator for many of New York City’s open spaces and actually opened one pool every week during the summer of ’36, totaling 11 pools for the Works Progress Administration project, with the help of Mayor LaGuardia. At the time of its opening, it was one of the biggest public pools in the world, and is three times the size of a standard Olympic pool. It had a capacity of 6,800 swimmers. Today, officials cap it at 1,500 people. For years it sat fenced up and unused, until the early 2000s, when Mayor Bloomberg put in a bid for New York City to host the 2012 Olympics. The pool would be used as a training facility for Olympic swimmers. A proposal to renovate the pool did not come to fruition, since the city did not win the bid. But in 2005, the pool was re-opened as an entertainment space, hosting artists like M.I.A. and Blonde Redhead. During this time, a company called Jelly NYC used to host weekend “pool parties” in the summertime (in addition to the bigger shows). It was hipster heaven; they sold cheap PBRs out of coolers, had a BBQ going, an adult slip-n-slide, and either a DJ or a local indie band playing. The Renegade Craft Fair also found a home there a couple of years in a row during that time. Everyone wondered whether the peeling paint on the surface of the pool contained lead or other carcinogens (maybe it did). In 2008, a $50 million proposal to renovate the pool was finally approved, and today it’s back to its 1936 pool glory. 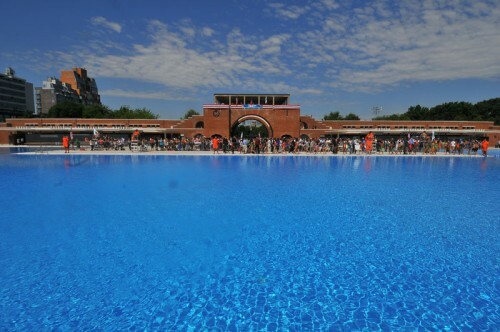 McCarren Park’s pool is now open daily, from 11-3 and 4-7. The pool is located at 776 Lorimer Street between Bayard Street and Driggs Avenue, at the nexus of Williamsburg and Greenpoint. –Everyone MUST have a combination lock (staff will check if you have one and make you leave if you don’t— the closest place to buy one is at the bodegas on Nassau & Manhattan, about $6). The lockers are small so you can’t fit a ton of stuff in them. –Your bag (and person) will be thoroughly searched, so you’re best off bringing as little as possible. So no boomboxes, picnic baskets, pool floaties, etc. Also, they do have a beach volleyball court if that’s your thing. –Cellphones are prohibited on the pool deck. They may be allowed in through the main gates (according to the pool site they’re not, but we saw people bringing them in), but you must lock them in your locker. Most likely this is to prevent creepers from taking pics of kids, but also so there’s no theft or people getting into arguments about phones getting wet or stolen. It’s actually kind of nice to be in a cellphone-free zone! People are actually looking at each other and talking amongst themselves! What a concept. Get into the digital detox. -To enter the pool deck area, you will have to shower. If you’re dry, the staff will make you turn around and shower off. Which is another reason you don’t want to have your phone with you. –The only items allowed on the pool deck are a towel and sunscreen. -On the pool deck, if you’re wearing a coverup or t-shirt, it MUST be white. No colors or patterns are allowed, probably because of potential gang violence, and/or sports rivalries. So though you can put down a towel and get your tan on, don’t plan on wearing your ornate rainbowy Mara Hoffman caftan because they’ll make you stash it. Also the white clothes thing helps you easily locate a staff member. Lifeguards are all wearing solid orange. –It’s free to get in. Yay FREE! (If you want to have fewer rules to follow and are willing to spend money, the pool at McCarren Hotel costs $60 day of or $40 in advance. Or you can be baller and buy a drinks and food reservation package ($100+ per person)). –There are no concessions inside the pool (and you can’t bring food in), but they have water fountains and coolers of water, and right outside the gates there’s a guy selling beverages, ice cream, and pretzels. Though the pool is VERY clean and well organized, you must be willing to follow ALL the rules. They’re trying to enforce safety and promote a positive community vibe. Another thing to note is the shift change from 3-4pm. We’re pretty sure they do maintenance tasks at that point; after thousands of people have been streaming in and out for hours, it makes sense they need to spiff things up for the afternoon crowd. If you come between 3 and 4, you may have to wait in a big line. Getting there earlier is probably a safer bet. Laura Apperson is a writer and editor from Atlanta, GA. By day, she works on narrative nonfiction and novels at St. Martin's Press. In her free time, you can find her exploring Greenpoint, reading, or working on her novel.